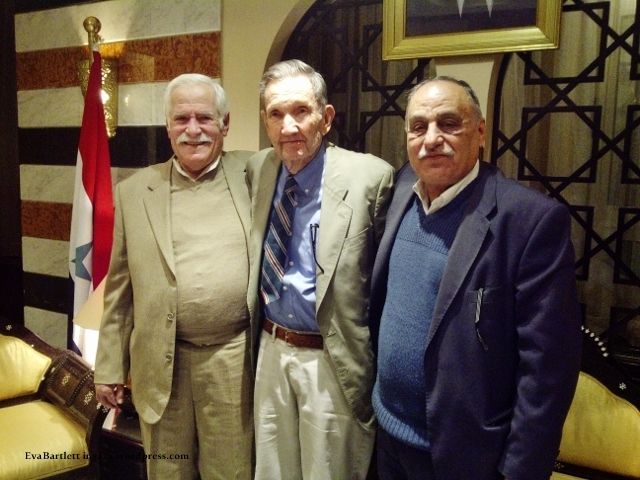 The words of Syrian Minister of Information, Omran al-Zoubi, on February 25, 2015, to our delegation of six US anti-war activists and myself, visiting Damascus Feb 24-26. Led by long time advocates for peace and justice, Ramsey Clark & Sara Flounders of the International Action Center, and by former Congresswoman and anti-war activist Cynthia McKinney, our delegation meets with an array of people in the continued effort to hear and transmit the wishes of the people in Syria, for a peaceful resolution to the NATO & co war on Syria. Following are some excerpts and musings from our various meetings and visits, including excerpts from some of my previously-published writings, for a full account of the visit. “What is happening in Syria is not a fight between the government and the people. If it were so, it would have ended very quickly…if the people had wanted. It’s about the people and terrorists. They used the ‘Arab Spring’ to send extremists to Syria. Libya is an example, and Iraq…The terrorist organizations we face have branched off from the Muslim Brotherhood (MB). In Afghanistan, al-Qaeda belonged to the MB, in Egypt, Turkey, Palestine. Erdogan himself is a member. Terrorism can’t be legal in one place and illegal in another. It is always illegal. Syria is the only country which had no debts to any country. We grow our own cotton and food. Education is free, including university. Health care is free. We are one of the only countries that actually treats cancer patients for free. 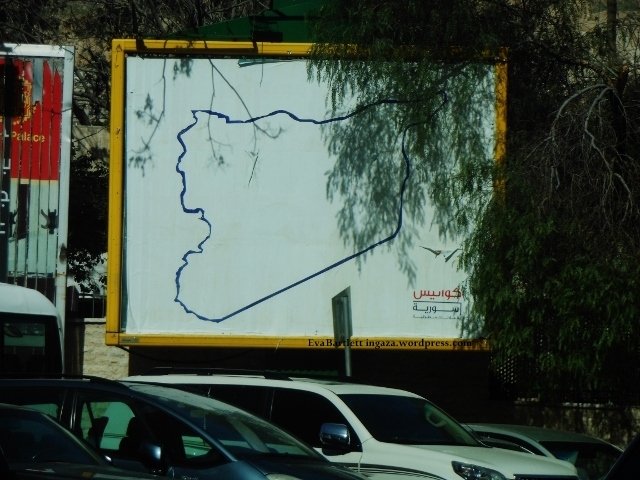 Syria is the most secular country in the region—the government doesn’t rule in religion. Syria did not sign a treaty with ‘Israel,’ did not allow ‘Israel’ to fortify the occupation of the Golan (My Note: Syria has also been one of the strongest advocate for Palestinian sovereignty and the end of Zionist occupation of all of Palestine—no ’67 borders BDS rhetoric; Palestinians in Syria enjoy full rights except those of voting and being in governmental positions, and are respected by their Syrian brothers and sisters. Neighbouring countries hosting Palestinian refugees could not come near to boasting the just-rights Syria has allotted Palestinians, nor the long-term solidarity. To the contrary, in every neighbouring country, Palestinian refugees are treated as non-citizens, endure hideous racism and prejudice, are segregated in abysmal camps without adequate services, and in general are not permitted to work any profession save menial work, no matter their credentials.). Syria refused to sign an EU partnership, because it was unfair to financial sovereignty of Syria. We refused the US occupation of Iraq; we took part in liberating Kuwait. When trouble started in Syria, the leadership tried to politically solve the issues. The (so-called ‘rebels’) slogans demanded constitutional reforms; there was reform. They demanded a referendum; there was a referendum. They demanded abolishing the state of emergency; it was abolished. In contrast, the West & co have flooded Syria with terrorists; the Western-Zionist-GCC narrative alleges Syria is the guilty party, and continues to concoct new allegations of Syrian wrong-doing, each proven lies and fabrications with very little time. “If President Assad leaves, there will be no Syria. The man is open-minded, he has already done and can do further reforms. When we stop the terrorism in Syria, in no way will we stop the reforms,” says Minister Mikdad. “If America wants to continue financing terrorists, under whatever guise—including training of so-called ‘moderate groups’—this means they are against the three UN resolutions on terrorism. We really don’t know what the US administration wants. They have allowed or sent tens of thousands from at least 83 countries to fight against us. Can you imagine 40-50,000 coming from Europe without their Intelligence knowing? But when our allies, like Hezbollah, come to our support, they are deemed ‘terrorists’?! 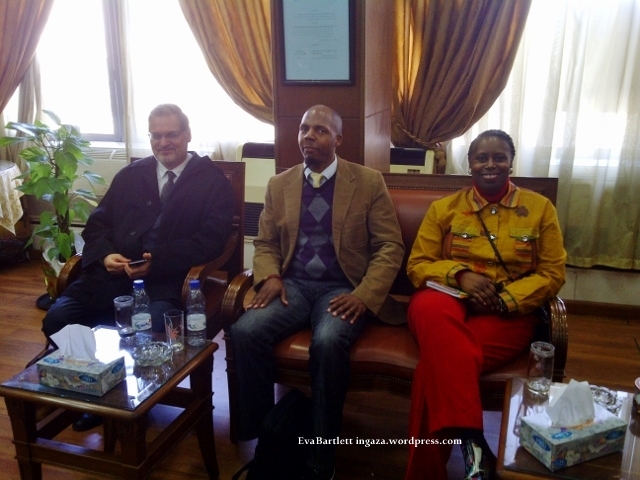 Members of the US delegation to Syria, including former Congresswoman Cynthia McKinney & IAC’s Sara Flounders. Speaking in Arabic, solemn and matter of fact, Minister of Justice, Najm Hamad al-Ahmad, likewise references 9/11, as well as the attacks in France. “What if the Syrian government had said, ‘They are revolutionaries, we need to train and supply them with weapons?’ This is what the governments from France and US are doing in Syria. They call them ‘moderates, insurgents.’ In fact, they are affiliated with al-Qaeda. Minister al-Ahmad keeps his words comparatively brief, allowing time to screen excerpts of a DVD detailing the various horrific acts of terrorism NATO’s “moderates” have committed from the start four years ago. He warns that the videos were graphic, would have a “painful effect,” but that this was precisely the reality Syrians are living every day. On the internet and doing research, I’d already seen many of the most horrific videos—be-headings, point-blank shootings—and indeed they are graphic and difficult to watch, and indeed they are the reality Syrian civilians and soldiers around Syria have endured over the years. The Hollywoodesque SITE videos portraying Da’esh’s supposed latest executions are nothing compared to the numerous cell-phone or most basic camera-shot videos, filmed up close and disgustingly personal… no fade-out-to-black before the deeds are done. These are the videos the West must watch, heinous crimes committed by the very non-moderate mercenaries John McCain has met with and applauds and which the US supports and trains. Syria has been screaming this truth since the criminals began their executions and kidnappings. Four years on, its time Western audiences paid attention. 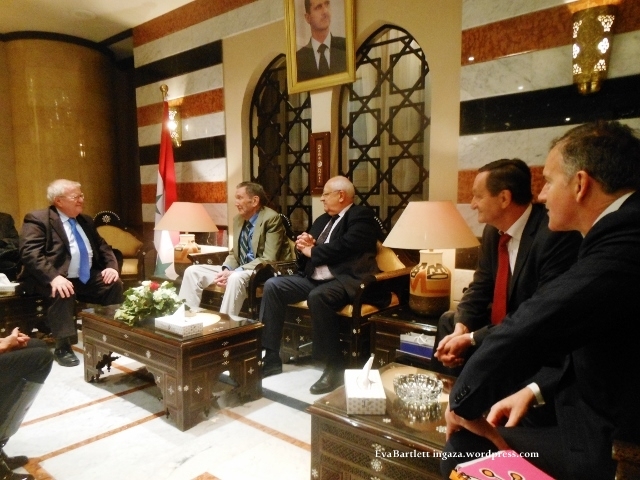 One unexpected meeting is that with four French politicians: two Senators, two Members of National Assembly, themselves on a private initiative to meet with Syrian leadership. Much of the informal meeting is discussion with Ramsey, however they do speak a little of their own mission. Another unofficial but interesting meeting is that with leadership of the Popular Front for the Liberation of Palestine (PFLP). 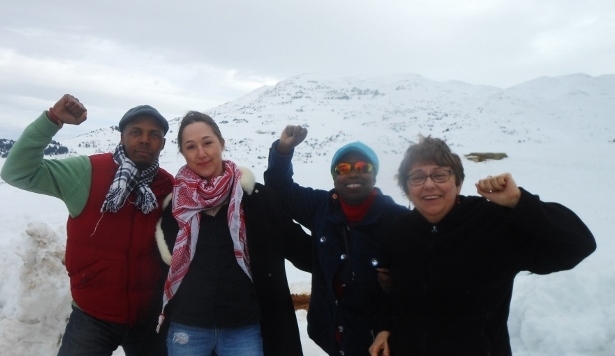 The two men we meet with are Abu Ahmad Fouad, Deputy General Secretary, and Abu Sami Marwan, member of the Political Bureau of the PFLP. As I am thrust into the role of translating (a humbling experience and reminder that I need to actually study Arabic), I don’t take notes in the meeting (Abu Ahmad, it later transpired, speaks English well and was enjoying having me try to translate). 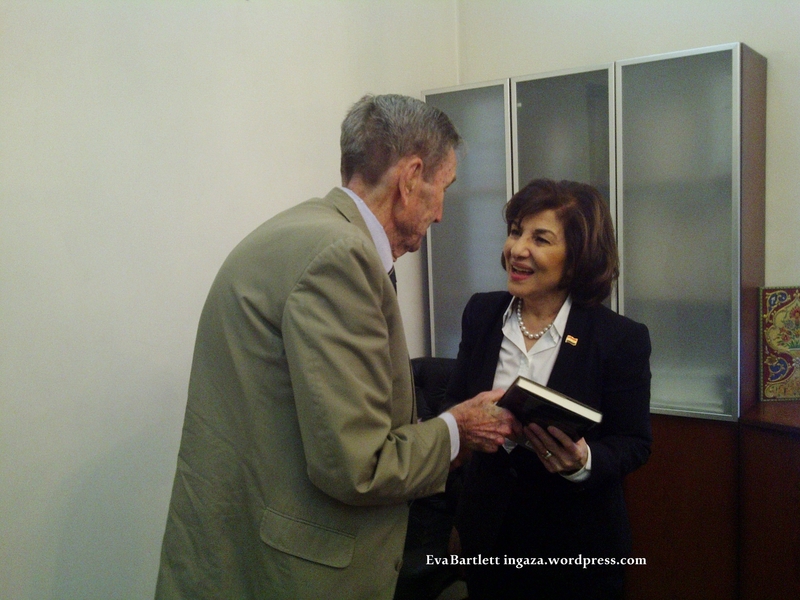 Formerly Attorney-General, Ramsey Clark has a keen interest in meeting with Syria’s BAR association, to see how courts were functioning during this time of crisis. Nezar Ali al-Skef, President of Syrian Bar Association, welcomes us and, in Arabic, assures Ramsey that Damascus’ courts have continued to function over the past four years. He points out the BAR association is independent and self-funded, meaning no financial support from the Syrian government. Skef also touches on the national reconciliation campaign, saying it continues to have good results. And he outlines the same basics as the others about the general situation in Syria over the past four years, the players behind these terrorist acts, about resisting the Zionist and terrorist ideologies, “We will remain steadfast against this terrorism and oppression,” he says. We visit the sordid reality of some of those uncountable ‘injured’—a word which never suffices in describing the different mutilations and amputations—from terrorists’ mortar and rocket attacks on civilian areas. I’m reminded of the ICU’s of Gaza hospitals, in both cases victims of the Zionist ideology and their collaborative scheming. Below follows excerpts from my previously-published account of the visit to Damascus’ largest hospital, University Hospital, where victims of terrorist rocket and mortar attacks were being treated. A young female doctor—who I will call “Rana” as I didn’t get her name—tours our delegation through the University Hospital’s 15 bed ICU, explaining the different cases as we go. Rana speaks of 4 of the injured patients. “One of them was discharged today, and three of them are still here in the intensive care. Three of them are siblings,” she repeats. They suffer different shrapnel injuries, after a mortar hit near their house four days prior, a doctor, Ali, explains to me. Me: “Where did the bomb come from?” Ali: “From Douma.” He doesn’t bother to add that the only armed persons who could have fired this are the terrorists who have been raining mortars and rockets from Douma all around, including on Damascus. I walk up to the next bed and hear Rana say, “Her baby, the infant, is safe.” An older nurse tells me the girl is 18 years old, five months pregnant, arrived at the hospital 4 days ago, and has mortar shrapnel in her brain. It was approximately two hours before they reached a hospital, the female doctor said. “We received them and gave them emergency. Intensive,” Rana says. In another bed, the third child (a three year old)’s head is wrapped in bandaging. Her case is critical, Ali tells me. She lies still, her only movement from the mechanical respirator. A 15 year old girl from al-Wafideen Camp, near Adra, (roughly 15 km NE of Damascus) lies with a bandaged head, her other injuries covered by a blanket. “She has shrapnel in her legs, chest and brain,” an older doctor explains. Her mother is in another bed. “They live in Ghouta, but fled to al-Wafideen, and still got hit by explosives. …They fled from their home to a safer area, and this is what happened..,” the doctor says. In another room, a fourteen year old girl lies awake, her remaining eye open, the other ruined by shrapnel. Both legs are in casts, broken, and one hand is bandaged. I’m told she arrived 3 days prior, from Arihah, Idlib countryside, injured by a mortar blast. Her situation is critical, the female doctor says. Idlib is some hours to the north; the girl has been brought to Damascus because her case is so severe. Another bed holds a 16 year old boy, part of his right leg amputated, shrapnel in his left. Another mortar injury. He’s from ad-Dumayr, roughly 30 km NE of Damascus, with Douma in between. The last injured boy I see is another teen, one leg bandaged up to his pelvic (s), the other leg missing from that point, and bandaging over his stomach. He was attacked in al-Kiswah, roughly 20 km east of Damascus. The word “injury” never suffices these sorts of life-altering mutilations. The elevator used by ambulances serving the hospital, reeks of stale blood. “No matter how much we wash it, we can’t get rid of the stench,” the older doctor tells me. In a downstairs office, the doctors explain more about the hospital. It had 860 beds, 40 more were added 4 years ago, to cope with the growing emergency cases. A university hospital, there are 500 residents, and 210 specialists. It gets an average of 500 emergency patients daily, not all of whom are related to terror attacks. While the hospital treats all that come for care, nonetheless—similar to Gaza, whose medical sector is in a far more (siege-and-bombing-manufactured) dire state—the hospitals around Syria lack certain medicines and machinery due to the long-suffered, criminal sanctions on Syria. 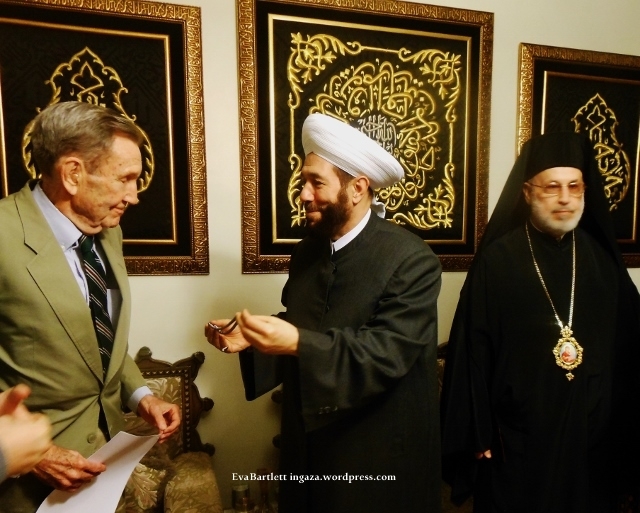 Two of the most interesting meetings were with Syria’s Grand Mufti, and with the Political and Media Adviser to President al-Assad. As I’ve written about them for Russia Today, I will include excerpts—marked by italics—from that article, for the sake of not plagiarizing my article. “Anyone who reaches his seventies in such good health has a girlfriend in addition to his wife.” Mufti Hassoun laughs louder than all of us, clearly enjoying our collective shock. He resumes seriousness, speaking of his country, ‘a beautiful garden’. 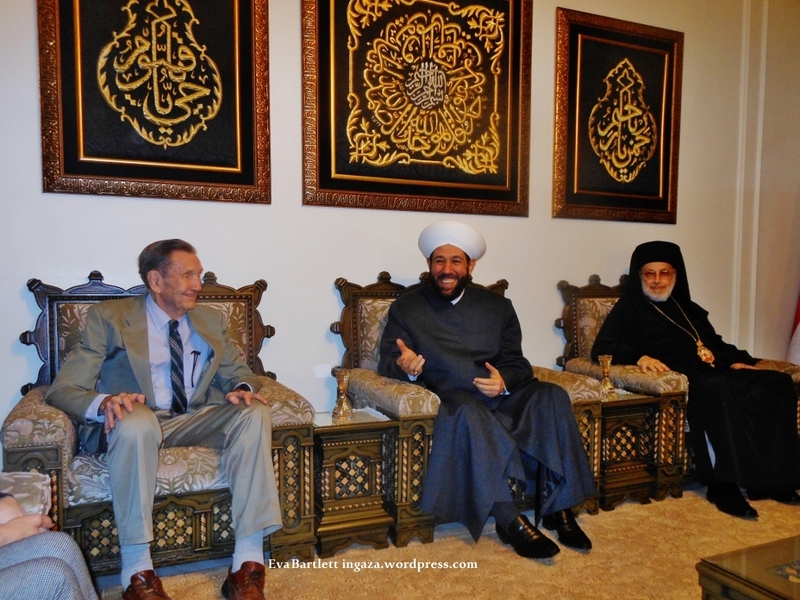 Unlike the Saudi Mufti – who has reportedly said “all churches in the Arabian Peninsula must be destroyed” – Mufti Hassoun is open-minded and committed to unity of people (not only the Syrian people): “God, is not a Christian or Muslim or a Jew. God is for all of us. Jesus was not a Catholic, nor an Orthodox, nor a Protestant. And Mohammed was not a Wahhabi, not a Sufi. Even three years and many recounts after the fact, again speaking of his son’s murder, Sheikh Hassoun falters and tears up. He speaks of “Saria, who “never carried a weapon in his life,” gunned-down after leaving his university. In a public address at the funeral the next day, Mufti Hassoun, while weeping, forgave the gunmen and called on them to lay down their weapons and re-join Syria. The following day, he received a text message saying the assassins would kill him as they had killed his son. Noting the sectarianism emanating from Gulf religious figures, he tells us of trying to find a place to pray in New York. “We arrived in New York, and went to pray in a mosque just 500 metres away from the UN, a mosque built by Kuwaitis. When I entered the mosque, I saw a Saudi Imam. His assistant was also from Saudi Arabia, and one of the most extremist people. They did not greet me….because we are ‘infidels’ from Syria. These are the people who are leading prayer next to the UN! Nowadays, not granted visa to many Western countries, he tells us of one rejected visa application, and of his interrogation by an American official at the US embassy in Amman, which he jokes felt like by grilled by the FBI. I told her, ‘Record this: With the American people in general, and with the extremist AIPAC regime. “Everything my cousin the Mufti said came from his heart, and from my heart, and are the same words that I say. We in Syria are one family. We’ve never known a country in the region which lives in such unity, where we live as though siblings from the same family. Because our faith, as Syrians, is that we are all children of God. Foreign countries planted at our side a state known as ‘Israel’, the state which now is waiting for any chance to attack Syria, because they don’t want a strong Resistance state in the region. They call we Christians ‘minorities’. But the Mufti was correct when he said we are 23 million Christians and 23 million Muslims living in Syria. We are not concerned about our status as Christians in Syria. We are deeply rooted in this land, even if America, Britain and the world don’t like this. Similarly, Mufti Hassoun is unambiguous in naming the real reasons behind the manufactured devastation in Syria. “Your coming to Syria means a lot of us. St. Paul once started a journey from this land to the rest of the world; we consider you the St. Paul of the world, coming to us, and you have brought many Mary’s with you!” he grins at us. As,we ready to leave, Sheikh Hassoun’s translator is not nearby, but Ramsey has a few words he wants to add, so I translate Ramsey’s best wishes for peace and an end to the war on Syria, words echoed by us all. 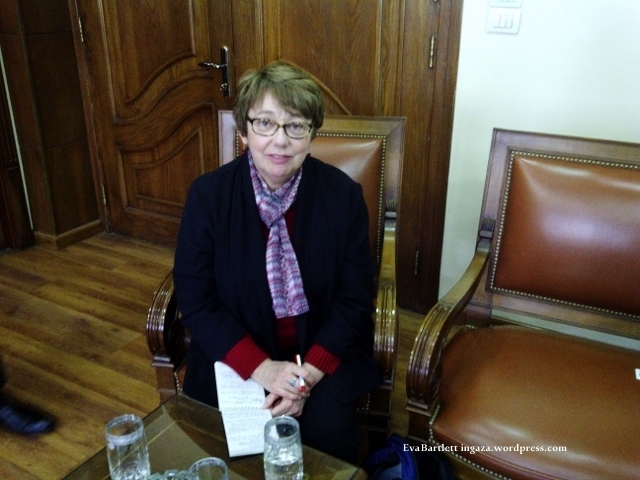 Presidential and Media Adviser to President al-Assad, Bouthaina Shaaban, shares the approachable nature of Mufti Hassoun, and in fact most of the representatives we are meeting. She sits with us at a small oval table in her modest office. As I’ve written about the meeting on RT, I include excerpts from the article below. 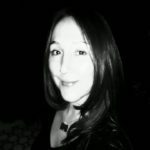 “I always wanted to be a bridge between Syria and Western cultures.” She has lived abroad, earning a PhD in English literature from Warwick University, on a Fulbright scholarship at Duke University, and later as professor at Eastern Michigan University. “I enjoyed American people, their hospitality and kindness.” Affection for the people aside, she is heavily critical of the US government and allies’ prolonged attack on Syria. Dr. Shaaban’s name was among the first to be put on America’s persona non grata list during this manufactured “Syrian crisis”. Later, I research a bit on Dr. Shaaban’s writings. Of her several published books, one in particular strikes me as breaching topics that Western democracy-loving, womens’ rights-promoting leaders would endorse: Both Right and Left Handed, New Edition: Arab Women Talk about Their Lives. Excerpts from the Amazon.com write-up include: “Arab women from varied social and economic backgrounds express a wide range of opinions on the traditions and institutions that shape their lives. 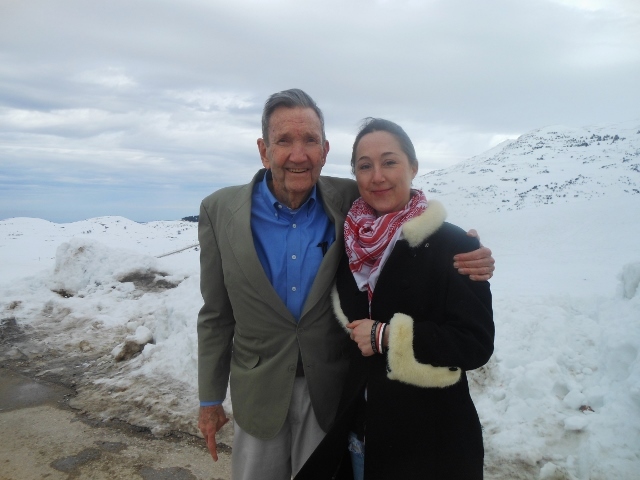 She tells the story of a Jewish family from abroad who in 1999 visited Syria, went to their ancestral homes and were shocked to find graves of their ancestors untouched. This is Syria. In contrast, the West’s imported, ever-circulating un-Islamic ‘moderates’ are actively destroying not only graves but any source of Syria’s heritage they can get their bloodied hands on. 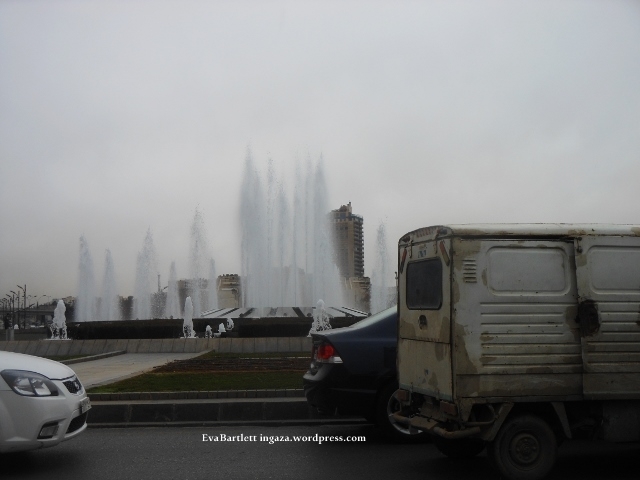 “…it is the lack of honesty in world politics that has turned our lives into shamble. Today is the fifth anniversary of the start of events in Syria and unfortunately during these four years we have lost hundreds of thousands of people and the lives of millions had been destroyed. The infrastructure of our country and our precious archeological heritage have suffered immeasurable losses. The human suffering is beyond description. Had American media and politicians enjoyed a particle of your honesty in conveying what you saw and heard we would have saved millions of people immeasurable pain. ← Avaaz call for a ‘no-fly zone’ in Syria. Thank you very much for bringing Syria into my living room Eva, i wish times were so much better.